You are on your way to making an informed decision about the right orthodontic solution for you! Remember, every orthodontic case is unique, just like every patient is unique. Use the options below to learn more about answers to common questions regarding braces and orthodontic solutions. Fill out the fields provided and we will be in touch with you as soon as possible to set up a date and time for your free consultation. We look forward to meeting you! You are one step closer to a beautiful smile! We’ve developed this page as a resource to help you get adjusted to life with braces. If you have any questions, please do not hesitate to ask us. Immediately after your bonding appointment, when we initially glue the brackets onto your teeth, we recommend that you start taking over-the-counter analgesics (i.e. Acetaminophen or Ibuprofen) and follow the dosing instructions on the bottle. Research studies show that you will likely experience a minor, dull, or achy discomfort a few hours after your appointment. This minor discomfort peaks at about a day after the appointment and gradually decreases over the next few days. During this time we recommend that you eat soft foods. Your teeth should feel completely normal about a week after your bonding appointment. It is not uncommon for some teeth to feel loose once they start to move. They will go back to normal once they have reached their intended position. 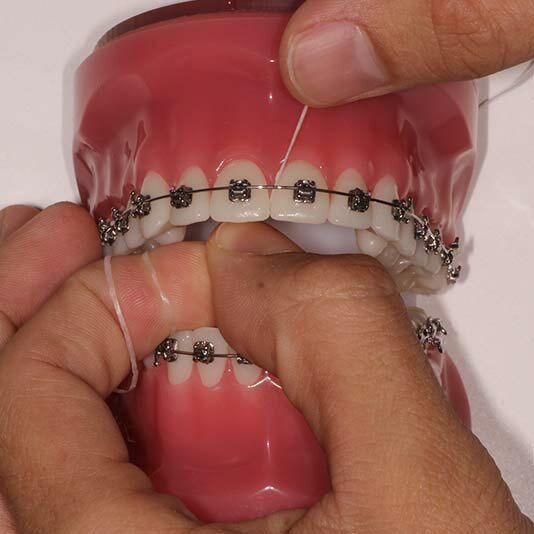 The braces and wire may rub against your lips and cheeks causing some irritation. Use the wax we provided and/or rinse with warm salt water. 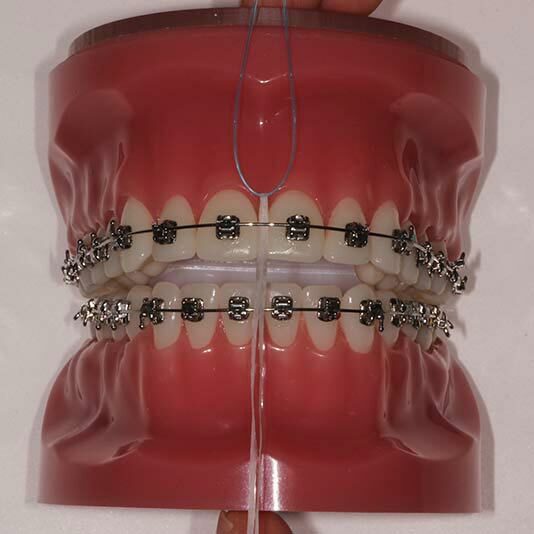 After a few days your cheeks will get used to the braces and wires and you will no longer experience irritation. 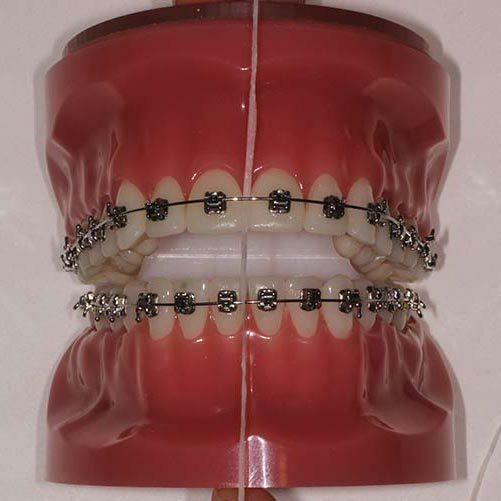 A bracket or two may come off after the initial bonding or during treatment. It is almost always not an emergency and can generally wait to be fixed. Use wax for temporary relief and give us a call to let us know. Sometimes we glue material onto your teeth to change your bite slightly when the braces come on. Also, once your teeth start moving your bite may feel a bit different. This is completely normal and part of treatment. Yes, you may eat during orthodontic treatment! It may surprise you that most foods can still be eaten after braces are placed on your teeth. The wrong types of food or eating the right kinds of food improperly can cause food to get caught in your braces, stick to braces, loosen braces, or bend wires. Place the brush between your gums and the brackets tilting the brush toward your gums at a 45° angle. The bristles should reach under your gums. Apply short back-and-forth strokes. Aim the brush bristles in the opposite direction tilting toward the brackets. Apply short back-and-forth strokes as before. Aim the bristles under the wire and toward the gums. Again apply short back-and-forth strokes. Be sure to do these steps on BOTH the outside/cheek side and the inside/tongue side of your top and bottom teeth. The last step is to scrub your chewing surfaces. Once braces are glued to the teeth, the task becomes more challenging since the braces tend to accumulate food and plaque. More dedication to oral hygiene is required than before. We inspect your teeth and gums at every appointment. Healthy gums appear pink and symmetrical. Unhealthy gums appear red, swollen, and irregular. Clean teeth are free of debris whereas teeth not properly cleaned have visible plaque formation. If plaque is left on a tooth long enough it may cause a white opaque discolouration on the tooth, which is the start of a cavity. Bring a pocket toothbrush with you wherever you go so that you can brush your teeth after every meal. If you cannot brush your teeth after a meal, make sure you remove debris by swishing with water. Use a waterpik to help remove debris and irrigate your gums. It is not a substitute for flossing, but definitely helps. If you have problems using the floss threaders, we suggest using the Platypus Orthodontic Flossers. We have given you a sample of these in your oral hygiene kit. GUM® Soft-Picks® are also very helpful to clean between your teeth, especially those at the back. If your gums show signs of puffiness, rinse with warm salt-water twice daily (one teaspoon of salt in eight ounces of warm water). Fluoride rinses used once daily are very helpful in protecting against cavities. Use the instructions on this website as a resource. If something is unclear, please ask us. We are here to help.  Using a toothbrush and Waterpik® can clean most, but not all, of your tooth surfaces. 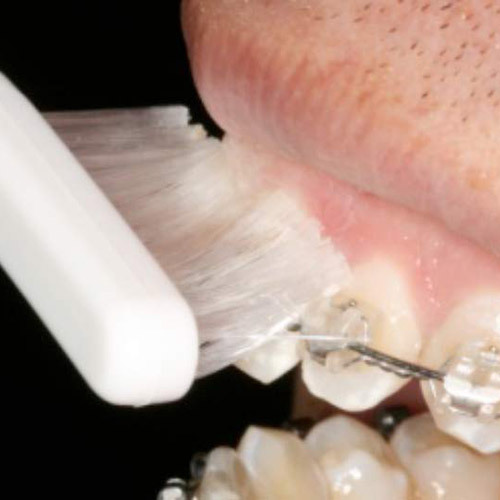 Accessing the entire side surfaces of your teeth is generally only possible with dental floss. 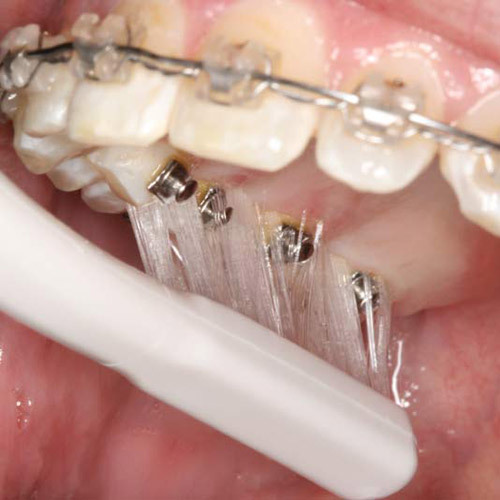 Since the archwire blocks a piece of floss from gaining access between the teeth, a threader is often required to loop the floss around the wire. It is important to floss at least once daily. The ideal time to floss is at night before going to bed. Flossing is time consuming but it becomes easy and routine once you get the hang of it. If you are struggling to find time for flossing, we recommend that you pair it with an activity such as watching TV or listening to music. Loop a piece of floss into the circular part of the threader. Stick the pointed tip of the threader under the wire. With one hand, hold onto the pointed tip; with the other hand, hold onto one of the two ends of floss that is hanging out of the threader. 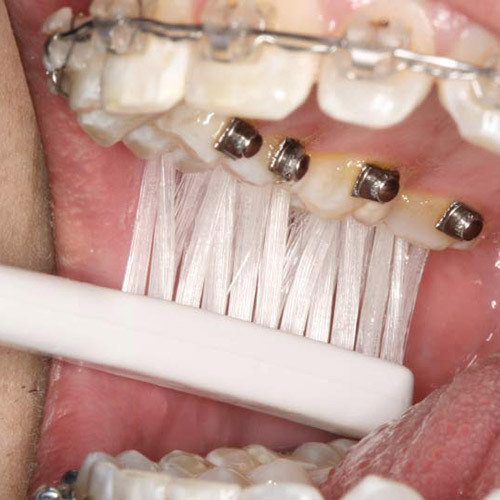 Pull the pointed tip of the threader while keeping the other hand firmly grasping the end of the floss. If you did this correctly, the floss should now successfully be underneath the wire. Tie the floss around both fingers and gently work the floss up and down the sides of the teeth. Make sure you get underneath the gum line. A true orthodontic emergency is very rare, but we are here to help you if you experience any problem with your braces. The wax we provided you with at your initial bonding is a very important tool. Make sure you always have a good portion of it remaining. If you begin to run low, please let us know and we will give you more. In the event that you are in significant pain outside of office hours and feel that you have an emergency that can’t wait until our office is open, you can contact Dr. Walt directly at: david@waltortho.com and he will get back to you as soon as possible. 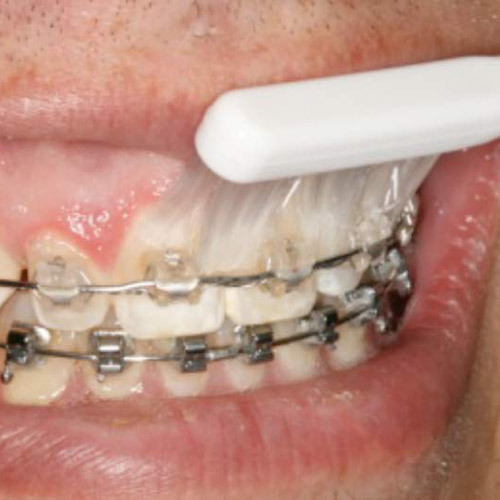 Sometimes brackets can become loose during treatment. It usually won’t hurt but may feel a little different than normal. Give the office a call to let us know so we can determine a time to see you. There is usually no immediate rush to fix a broken bracket. We intentionally leave the wire a little long in some instances but bend the wire away from your cheek so it doesn’t poke. You may feel the wire at the back of your mouth but it shouldn’t hurt. 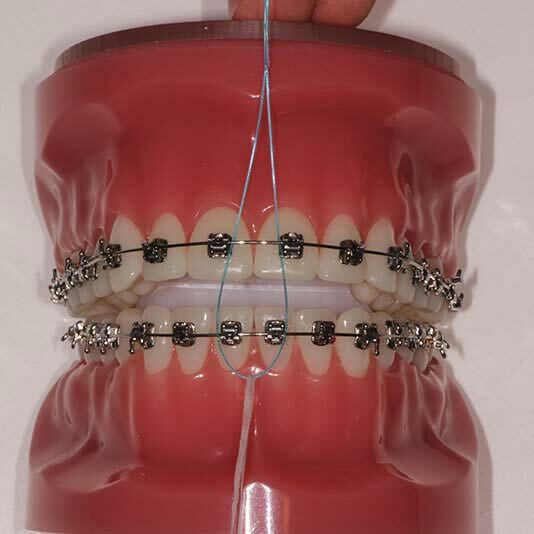 When teeth start to align or when we are closing a significant amount of space, the wire may start to poke at the back. In all of these instances use the wax for temporary relief. If you are still in pain give the office a call and we will bring you in to clip the wire. Sometimes fixed expanders or space maintainers can get loose or even fall out after they are in the mouth for a prolonged period of time. If the appliance falls out leave it out of your mouth – do NOT attempt to re-insert it. If you notice just one side is starting to feel loose, leave it in place and don’t pull it out. Call the office and we will re-cement the appliance for you soon thereafter. When considering orthodontic treatment, we want you to make an informed decision. Dr. Walt and our treatment coordinator will discuss the entire orthodontic process during your complimentary consultation, but feel free to peruse some educational content we have put together. Walt Orthodontics is a specialty practice conveniently located at the confluence of Vaughan, Thornhill, Maple, Richmond Hill, Woodbridge, and King City. We specialize in Invisalign and Braces, and this singular vision ensures that we provide focused care for patients. © 2019 Walt Orthodontics. Created by Roketto. Created by Roketto. © 2018 Walt Orthodontics. Fill out the fields below and we will be in touch with you as soon as possible to set up a date and time for your free consultation. We look forward to meeting you! In case we need to follow up on your submission, please include the following contact information.